Video has long played a vital role for capturing and archiving a scene. Many new police vehicles come equipped with video equipment or can be upgraded with several video options. Many new trucks for the fire service are now coming equipped with video cameras and several aftermarket vendors offer video products for the fire service (1). Many disaster responses through FEMA or NWCG collect aerial video either from air helicopters or from unmanned aircraft (drones). The special units of some police departments are now using wearable cameras, many bomb tech teams use ground robots equipped with video cameras to remotely dispose of explosive threats, and with the proliferation of free, readily accessed video hosting such as that of YouTube Channels, one easily finds numerous videos recorded on cell phones or other small recording devices. It is not a matter of collecting video - it is a matter of seeing the video, and the timing, which determines whether you can use it during the scene, or only after when the greatest utility has already been lost. From the few examples above, it is clear that video has established its value for First Responders. For those departments with video resources, the problem is not in getting video, it is in who can see what the cameras see. Generally, dash cam video is recorded to document the scene and reviewed later if need be. The same holds true for many of the video options available for the fire service. With recorded video, the events being shown have already occurred and, while these recordings are a great training tool, the past cannot be further optimized for maximum use in the present. For example, having the real-time ability to zoom in on a suspect mid-scene that one might otherwise struggle to positively I.D., manually refocusing when automation fails to pinpoint, or simply panning toward an interest that is only just out of frame. The big question then is what difference would it make if we could distribute that video to all responders - both on-scene and off - who really need to see it in real-time to make decisions? A company in California called SEMCO has developed a system that distributes video from nearly any source to any iPhone, Smartphone, laptop computer or desktop computer. The product is called the VDU-100. SEMCO originally developed it for the military in response to the requirement for real-time video and audio collection, transmission, and distribution in support of missions ranging from covert operations to support of emergency management agencies. 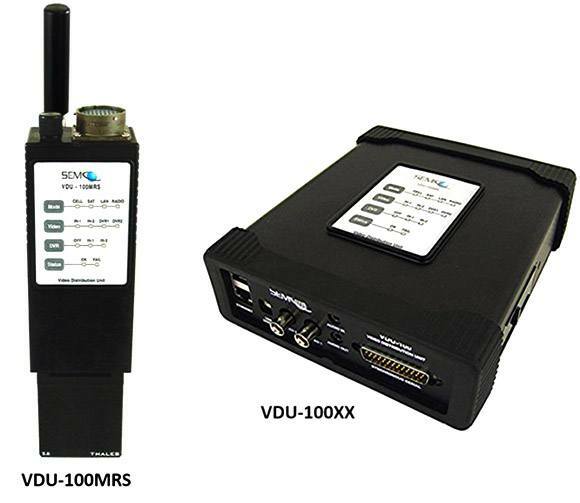 The VDU-100 provides audio-video communications from team member-to-team member as well as from team member-to-command. Transmission modes include hand-held radios, wireless and wired LAN, satellite phone, wireless mesh, and 3G/4G Cellular. Video resolution, bandwidth and frame rates are adjustable, with high quality video frames capable of being transmitted in bandwidths as low as 9 kbps. Other features include internal digital video recording as well as remote video enhancement, pan, tilt and zoom control, and multiple NTSC/PAL camera and imaging device interfaces. With administrative and password control, these products provide for unlimited remote viewing on PCs, laptops, smart phones and tablets, anywhere in the world. The military was looking for a way to broadcast video over long distances, in real time using their existing wireless communication infrastructure. “To do that over their existing radios (that also had a data streaming capability) required extremely powerful compression. The existing commercial encoders – MPEG2, MJPEG, MPEG4 – could not handle the typically low data rates of these legacy radios (e.g., 9600 Baud, 16 Kbps, etc.). So we worked on finding an encoder that could operate at those low data rates. We then populated the VDU-100 with features that recognized the unique nature of situational awareness on the battlefield. Before, the soldier could get a photograph transmitted in about 10 minutes at 9600 Baud. With the VDU-100 at that data rate, he can witness 5-6 frames per second,” said Mike Samuels SEMCO’s Director, Marketing & Sales. Why is it so important for first responders then to distribute video? “It's hard to envision a situation where/when a first responder is not putting him or herself at risk in the response. When possible, having real-time video provides the responder with improved situational awareness. Similarly, having video intelligence that can be transmitted beyond the boundaries of the response, enables both decision makers and subject matter experts (SMEs) to assist in that response,” said Mike Samuels. However, verbally relaying what one sees to someone else who does not see it can lead to problems. Sometimes critical information can be lost in translation. “Video can often speak for itself. It does not typically rely on verbal descriptions for understanding. Now that the VDU-100 can readily move video from its point of collection (e.g., ground control station), more personnel can provide immediate, more effective support, said Samuels. iPhone screenshot from unmanned ground vehicle video of one of the “casualties” in a multi-agency first responder experiment. Since purchasing the unit, the Columbus PD have used it for other purposes as well. In one such usage, they were supporting the Federal government in an exercise. “We were requested by Georgia's U.S. Marshall to help out with a training exercise in a federal building. We arranged to have 28-30 separate cameras monitored and sent to one designated monitor that they controlled, which we fed into the VDU-100,” said Rawn. This application was working very well for them, but they ran into a bit of a bureaucratic snag, “One of their security people got concerned about the live feed being broadcast, so we dropped back to plan B. We sent in one of our bomb robots that recorded and we plugged [the VDU-100] into the controller. We saw and heard everything as the training exercise played out, but from only the robot's cameras,” he explained. The CPD also used the VDU-100 during a big civil works project that re-shaped parts of the Chattahoochee River to make way for a whitewater rafting course. “We had a fixed controllable camera, the mast camera on the bus and the helicopter down-link feed to cover the removal of 2 different dams (weeks apart) from the Chattahoochee River. We had better coverage than the news media,” said Rawn. SEMCO has worked with other departments around the country as well. These departments have used the VDU-100 for many other applications. Samuels explained, “The applications have varied from tactical covert video surveillance, to hostage rescue operations, to harbor patrol. The missions that can benefit from video distribution are as varied as the missions themselves. Envisage the pursuit of a fugitive employing both air and ground assets. Typically, the only way the pilot (or ground controller) can describe what he/she is seeing is by radio. That situation can be confounded by either imprecise visual cues by the pilot or a misinterpretation of what was described. If some of the assets on the ground had video displays, they could more readily validate what the pilot is relaying. 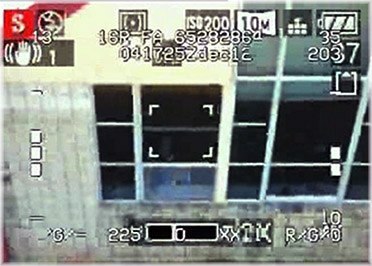 Still shot from video from an unmanned aircraft through the windows of a building as seen when distributed to, and viewed on, an iPhone. For more information, view SEMCO’s website at http://www.semco.com. To speak with Lt. Rawn about Columbus PD’s use of the product, he can be reached via email at BRawn@columbusga.org. 2. The School of the Americas protest occurs annually at the front gate of Fort Benning, Georgia adjacent to Columbus. The Department of Defense re-named the school the Western Hemisphere Institute for Security Cooperation in 2001. A protest group called SOA Watch sends thousands of people every year to the annual protest.